CollageIt for Windows XP - a minimalist program designed to create the style of images in one graphic collage. The tool offers the possibility of including a huge number of photos in a single object and can work with backgrounds, frames, shadows, colors. The functionality of the application supports advanced settings for printing or saving files in high resolution. The simplicity and minimalist design allow you to deal with the interface and features of the software from the first minutes of use. 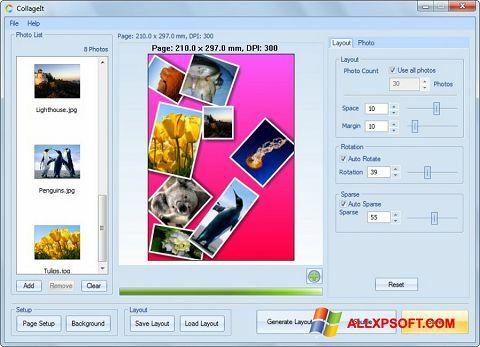 You can free download CollageIt official latest version for Windows XP in English.